It's inevitable, unless you're a hermit or everyone you know lives next door to you, that you will have to do some long distance traveling with your new little bundle! While the thought of it can be daunting just remember to breath and start planning as soon as you can! It's never too early to start a list of things you don't want to forget! 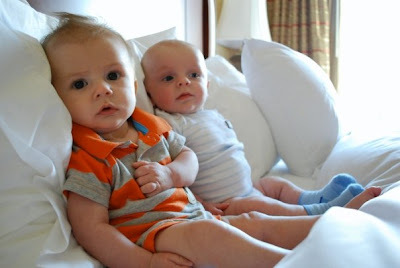 When it came to traveling with my little bitty babies, I found that it was better for everyone if we over planned, over packed and yet were prepared to go with the flow. If you are traveling to someone's home for the first time I would suggest that you bring your own pack and play or bassinet for baby to sleep in. Sometimes just the sight and sound of something familiar to baby helps to continue on your usual routine away from home. And really, you never know what you will find when you get to someones home. For me it was always better just to throw the pack and play in the car with everything else. You know it's clean, safe and up to date! Pack more diapers, clothes, wipes and food than you think you will need. This will keep you from running to the store for that one thing that you ran out of or from panicking when you run out of clothes. Keep your diaper bag stocked with bum cream, any medication you or your little one may need, a first aid kit, nursing pads, etc. I'd rather carry a little bit of everything than forget something. Always bring a jacket and long pants. Always. It never fails that the one time I forget or choose not to do it, is when we need them! And take it from my personal experience, even if a hotel promises you a crib for your room, don't count on it being there. Take the pack and play EVEN if you reserve a hotel crib or in lieu of one anyway. If you're driving, prepare for extra stops to change and feed. Being able to take your time is a lot easier than having to rush at break neck speeds! Having plenty of time adds to good moods, happy babies and good attitudes! If you're flying, try to plan fly time during nap time and feed baby as you take off - this can be done with baby in a carrier! The important thing above all is to relax! Make the travel part of the trip and it becomes a lot more fun. Be prepared for disasters and good times alike! How about you? What's your best baby travel advice? Check out the Huggies Mommy Answers Facebook app and find more posts from bloggers sharing their experiences of motherhood on the Huggies page on BlogHer.com.